In the second edition of this MAA classic, exploration continues to be an essential component. More than 60 new exercises have been added, and the chapters on infinite summations, differentiability and continuity, and convergence of infinite series have been reorganized to make it easier to identify the key ideas. 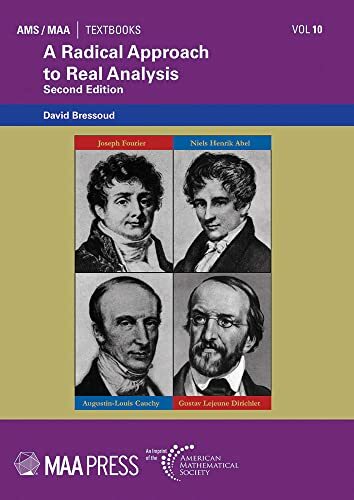 A Radical Approach to Real Analysis is an introduction to real analysis, rooted in and informed by the historical issues that shaped its development. It can be used as a textbook, or as a resource for the instructor who prefers to teach a traditional course, or as a resource for the student who has been through a traditional course yet still does not understand what real analysis is about and why it was created. In the second edition of this MAA classic, exploration continues to be an essential component. More than 60 new exercises have been added, and the chapters on infinite summations, differentiability and continuity, and convergence of infinite series have been reorganized to make it easier to identify the key ideas. David Bressoud is DeWitt Wallace Professor of Mathematics at Macalester College, Minnesota. He is Chair of the MAA Committee on the Undergraduate Program in Mathematics and Chair-Elect of the MAA Special Interest Group on Teaching Advanced High School Mathematics.